Pizza boxes face a twin challenge: how to keep the pizzas warm but let the steam out so they don't get soggy. A Mumbai businessman found an elegant solution that has been patented in over 70 countries. Familiar with corrugated cardboard which is used in pizza box packaging and none too pleased with the state of his pizza, he simply used a Swiss knife to gouge out, in strips, the upper and bottom layers of the cardboard. By doing so, he allowed the box to breathe while still preventing contamination. Vinay Mehta is a long-time Reliance Industries food vendor, whose family was into the manufacturing of corrugated boxes since 1977. As Mehta says, he had been dissatisfied with the state of his pizza packaging for a while, and being in the business, thought a solution should be found. So, on an early Sunday morning in 2006, while travelling on the expressway from Mumbai to Pune, he simply took out a Swiss knife and cut the upper and lower parts of the box in strips to let it breathe. Is integrated into the corrugated cardboard which is made of three layers. Steam flows out from the top and bottom, but the ridges keep the box uncontaminated, insulated and heated. Mehta had to wait till 2011 to get patents for his product. The box design became known to the larger world through Scott Wiener, a Brooklyn Pizza enthusiast, who holds a record collection of pizza boxes. After Wiener wrote in his book Viva La Pizza! that VENTiT's was the world's best-designed pizza box, media caught hold of it and the box received publicity in the US. Mehta has an autographed copy of the book. Having been a vendor for more than 30 years, Mehta says he knows the angst that disrupting the supply chain can cause. It's also a good business strategy to keep the chain intact. He wants to license his technology rather than manufacture the boxes himself. In fact, his patent is primarily for the process of cutting the corrugated cardboard strips as a manufacturing step. 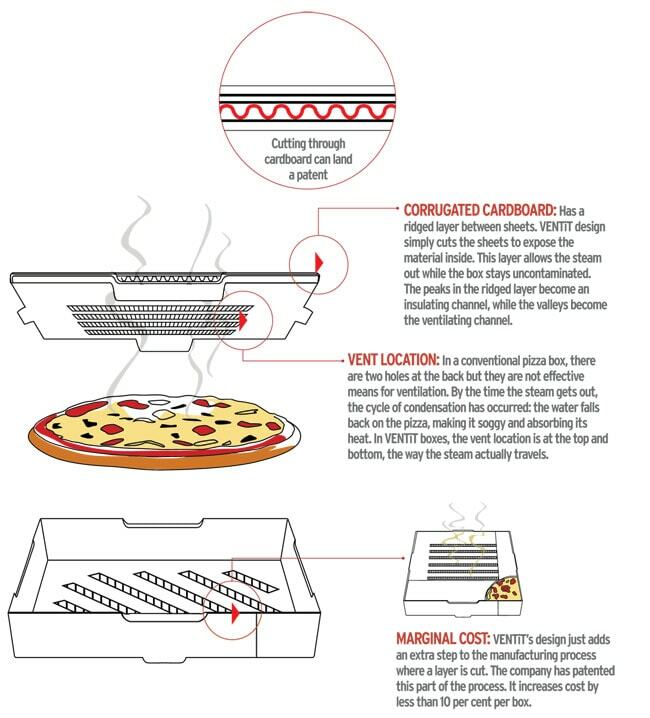 Pizza boxes are just one of the items with the steam/soggy problem, VENTiT's packaging can be used for a large number of food items. VENTiT already has clients for items like paranthas, French fries and grilled sandwiches. More generally, the concept can be used for cold storage of fruits such as mangoes, and in areas offloriculture and agriculture. Mehta returned earlier this year from a business conference in Las Vegas where he was already well-known because of a viral Yahoo! video, but it isn't clear what deals he has cut. At the moment, he is looking for production partners in the countries he has patents in.